How to clean water blocks? 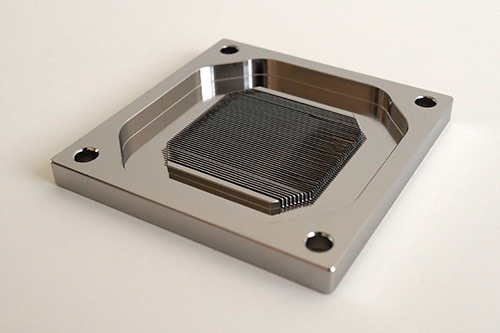 Water blocks may be disassembled for cleaning purposes on an occasional basis. 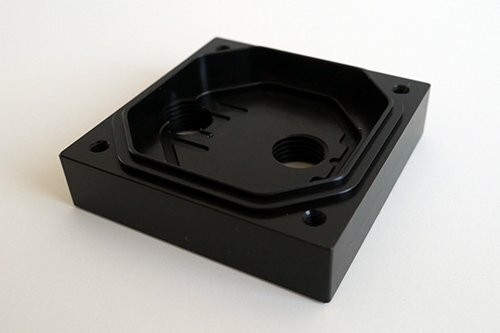 The warranty is not rendered void on dis-assembly of the water block, but the customer loses the EK leak-free guarantee which comes with a factory tested water block. An old, but soft toothbrush is an excellent cleaning tool! 5% vinegar is enough to kill 99.9% of algae and bacteria that could be present on copper in not maintained cooling loop as well. 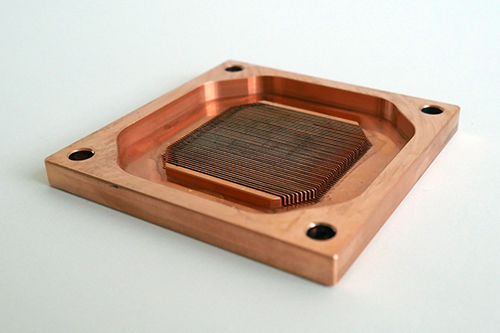 Upon cleaning, it is necessary to flush the water blocks in water and rinse them with distilled water. After rinsing, we recommend wrapping the water blocks in paper towels until completely dry. It is nearly impossible to avoid naturally occurring copper tarnishing (oxidation) as the oxidation will reoccur the moment the copper is cleaned of the all oxides. When cleaning nickel plated copper, it is forbidden to use any aggressive chemicals (or vinegar) or rough materials as you may damage the plating and thus void the warranty. Please note also that due to presence of dye additives and other chemicals, the nickel layer may also become discolored/stained over a period of time. However, the staining is normally reversible by simple flush and rinse. Polish the hardened deposits (such as algae or dirt) from the nickel plated copper if necessary. EK recommends the use of automotive soft, non-abrasive metal polish creams. After you finish using other cleaning methods, give the nickel plating a good polish with a non-abrasive metal or chrome polish. Apply a small amount of polish to a cloth or to the surface of the nickel. Wipe the entire surface of the nickel with the polish, using small circular motions, until it looks shiny and clean. Use another clean cloth to remove the remains of the polishing paste from the surface. Always rinse with distilled water after you are done with polishing. Acrylic will fail prematurely if subjected to even small amounts of alcohol, acetone or other aggressive chemicals. 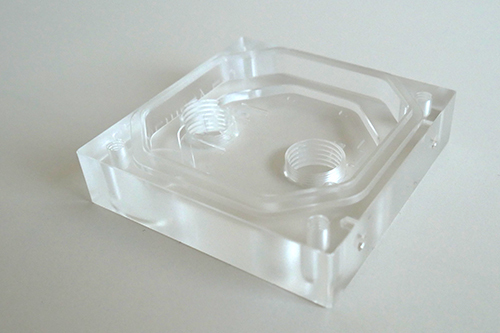 Please do not use anything but warm, soapy water and a toothbrush to clean the acrylic (plexi) glass water block tops and reservoir tubes. Using aggressive chemicals will surely void your warranty! Algae- or dirt deposits may be rubbed out using a soft cloth in combination with warm, soapy water. Rinse with distilled water after cleaning. POM (polyoxymethylene) or Acetal can withstand chemicals such as alcohol or acetone but EK recommend using these very sparingly as the drying chemicals will certainly leave some residue. Usually POM can be cleaned easily with just a soft cloth and warm, soapy water – without the use of any chemicals. Rinse with distilled water after cleaning. Using a corrosion inhibiting coolant (such as EK-Ekoolant or other market proven coolant) is highly recommended for any water cooling loops. Since EK-Ekoolant is also a surfactant, it will prevent algae growth and dirt deposition on all wet surfaces. Clean the radiators and flush them with warm water prior to use. You may use a vinegar/water solution. Radiators are – due to the nature of manufacturing – usually the source of all dirt particles found on the loop. Always rinse the radiators with distilled water after you have finished cleaning. Refrain from using Copper Sulphate based additives in your loop in order to prevent tarnishing on your water cooling gear internals! Usually when cleaning the water blocks, there is a black residue left on the copper from what seems to be O-ring grease mixed with degraded rubber. I take care to remove that, and grease the O-rings to keep the rubber lasting longer, and if i find that they are too thin or they are so brittle they have a crack, I replace them. I like your guides, and I’d like it if you mentioned maintenance of the O-rings (cleaning, greasing and replacing) since they are absolutely essential for keeping the system leak-free. What type of grease is used for the seals/rubber gaskets?